Where in the World is Carmen Sandiego? That is the question that has been on people’s minds for quite a long time, as far back as the video game “Where in the World is Carmen Sandiego”. You might wonder “Who exactly is Carmen Sandiego?”. Carmen’s life began at a little programming organization during the 80’s called Broderbund. In the wake of trying different things with animation and easy to understand designs, an ex- Disney illustrator, and a group of gifted software engineers, thought of a game where you pursued criminals using clues and deductive thinking. Gary Carlston, the manager at Broderbund, suggested the idea of having a geology theme and included a duplicate of the World Almanac (reference book filled with facts about the world) inside each box of the game. Be that as it may, the game still required a name for the game, a script, and characters. Before David Siefkin left to wind up an outside administration officer at international safe havens around the globe, he made a gallery of criminals for a game (then known as ‘World Quest’). Among them was a lady who caught the eye of Katherine Bird: Carmen Sandiego. Inspired by Brazilian singer, Carmen Miranda, Katherine Bird thought the name was an ideal blend of interest and fervor. Now with a title, would-be players would know who they would look for. Back then, videogames were viewed as a thing for young men, but after Carmen, young female gamers now had their very own symbol. After everything was finally put together, the game discharged for the Apple II in 1985. It gradually, yet without a doubt, turned into a gigantic hit, yet not with the general audience they expected. The group at Broderbund never planned for the game to be educational, believing that nobody would want to buy the game. Be that as it may, as an ever increasing number of individuals began discussing it, instructors found out about it and purchased duplicates of the game to implement them into their lesson plans. The ACME detectives would pursue Carmen, the leader of V.I.L.E. (Villains International League of Evil) and its individuals all over America, Europe, the Solar System, and even the space-time continuum. After a National Geographic survey uncovered that 1 out of 4 Americans couldn’t find the Pacific Ocean on a map, PBS makers felt it was their obligation to show the next generation of America, geography. So the game show “Where in the World is Carmen Sandiego?” was brought into the world with its first episode on September 30, 1991. Something new that they added to the blend was the Chief. In the computer games, you would just communicate with ACME through a PC readout, yet as the Chief, Tony award winning actress, Lynne Thigpen, turned into an icon with her blasting voice and overall big personality. Between production of the first and second season, the team was met with a minor issue: on December 26, 1991, the whole Soviet Union dissolved, changing the geopolitical landscape forever, and adding 15 new countries to the map. This made the producers to pull back season one reruns and for the Chief to issue a disclaimer that all data was exact up until that point. The show finished it’s noteworthy 5 seasons and even returned with a spin-off “Where in Time is Carmen Sandiego?” that finished after two seasons. 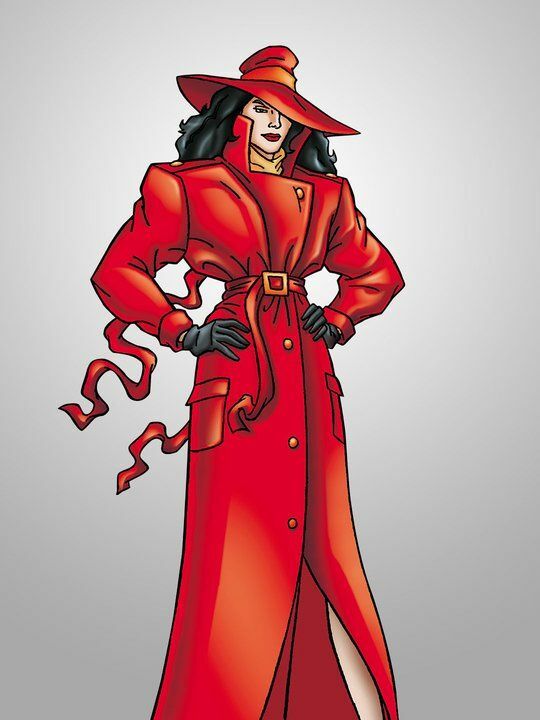 Both the computer games and the game show didn’t give much insight on Carmen’s past until the 1994 animated series “Where on Earth is Carmen Sandiego?” While still instructive, the show was more story-driven and concentrated somewhat more on Carmen’s origins. The series followed, Zack and Ivy, with holographic AI, Chief (same voice actor that plays Squidward on Spongebob) to catch Carmen no matter what. Carmen’s voice actress was was none other than Rita Moreno. The incredible EGOT (Emmy, Grammy, Oscar, and Tony grant) winning vocalist and performer from “West Side Story” and Netflix’s comedy/drama, “One Day at a Time”. She was the first Latina woman to ever win this status. In “Earth”, Carmen Sandiego was taken in as a newborn child by ACME and rapidly rose to be their most noteworthy detective by the age of 17. When catching criminals turned out to be too simple, she established V.I.L.E., and ultimately, became the world’s greatest thief. After Broderbund was purchased out and rights went to The Learning Company in 1998, new Carmen titles were born that utilized the backstory as found in the series, yet didn’t achieve as much popularity as the originals. Not even a 2011 Facebook mobile game could bring her back to life in mainstream. For years there were rumors going around that a real life motion picture was in progress that would star Sandra Bullock or Jennifer Lopez, yet the film never made it out of development. Until Netflix declared a a reboot for 2019 featuring ‘Jane the Virgin’ star, Gina Rodriguez, as Carmen and “Stranger Things” actor, Finn Wolfhard as Player. The new show puts a spin on Carmen’s beginning. Rather than founding V.I.L.E., she learns how to become a professional thief, drops out, and vows to take the world’s artifacts before V.I.L.E. can get to them. For 30 years, Carmen Sandiego has shown the youth around the globe about different nations and cultures and how big, diverse, and beautiful the world can be.